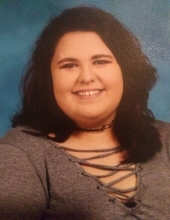 Taylor Denise Beck, age 16, of Duluth, GA, passed away suddenly Thursday, January 17th, 2019. Funeral services for Taylor will be held on Sunday, January 27th, 2019 at 2:00 p.m. in the Peachtree Corners Chapel of Crowell Brothers Funeral Homes & Crematory. Entombment will follow at Peachtree Memorial Park, Peachtree Cornes, GA. The family will receive friends on Saturday evening, January 26th, 2019 from 4:00 p.m. until 8:00 p.m. Taylor was of the Baptist faith. She loved reading, music, singing in the chorus at school and fishing. She loved spending time with her friends as was always the life of the party. She will be remembered by her infectious laugh that would brighten anyones day. Taylor was preceded in death by her maternal grandfather, Joe Milford Beck. She is survived by her father, Frank Pierce Cabral II and mother Amy Beck; maternal grandmother, Phyllis Beck; brother, Jeremy Beck; sisters, Skyler Beck and Brittany Dauge. In lieu of flowers the family asks that contributions be made in helping the expenses for funeral expenses. https://www.gofundme.com/funeral-fund-for-taylor. Online condolences may be expressed at www.crowellbrothers.com. Arrangements entrusted by Crowell Brothers Funeral Homes & Crematory, 5051 Peachtree Industrial Boulevard, Peachtree Corners, GA, 30092. To send flowers or a remembrance gift to the family of Taylor Denise Beck, please visit our Tribute Store. "Email Address" would like to share the life celebration of Taylor Denise Beck. Click on the "link" to go to share a favorite memory or leave a condolence message for the family.